The Patch Management module provides the ability to effectively manage locating the missing patches, and the downloading and installation of those Microsoft and third party software patches across your customers' networks. MSP N-central Patch Management uses rules, caching, multiple maintenance windows and automated approval methods to enable you to automate the patching of devices under your management. With Patch Management you can manage downloading and installing Microsoft and third party software patches across your customers' networks by targeted rules. By using multiple approval methods you can download, distribute and install patches that are approved either automatically or on individual basis. 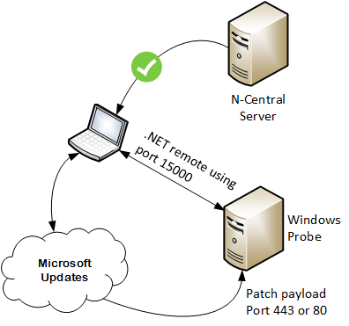 When MSP N-central installs a Probe, it also installs the N-able Patch Repository Service that communicates on port 15000. The Probe receives download requests from the Agent for patch installers and downloads them from the web to distribute to any requesting agent. The Patch cache is located in the C:\Program Files (x86)\N-able Technologies\NablePatchCache folder. Patch information is stored in the file CacheMetaData.xml, located in the Patch Cache folder with the installer files. You can set the patch cache folder location and size. Perform a pre-deployment self-audit to evaluate your patching requirements. Review and work through the Patch Management Set up Checklist. The Agent communicates with the Windows Update server and requests a list of available updates. The Agent sends the list of updates to the MSP N-central server. The Administrator reviews the list of updates and configures the approvals for the list of possible updates. MSP N-central notifies the Agent which updates it can apply. The Agent communicates with the Probe to request the approved updates, or downloads them directly depending on the profile settings. The Probe downloads the updates. The Agent downloads the updates from the Probe and applies the patches determined by the schedules defined by the Administrator. The agent retrieves a list of updates from sis.n-able.com and compares available third party updates to the list of applications installed on the device. The Agent sends a list of third party applications that need updating to MSP N-central, where the Administrator has configured the approvals for the list of possible updates and notifies the Agent which updates it can apply. The Agent communicates with the Probe and requests the approved software patches or downloads them directly from the source based on the profile settings. The Agent downloads the updates from the Probe and applies the patches determined by the rules defined by the Administrator.